No matter what your drink of choice, Game of Thrones is determined to make sure there's an official version of it for you. There's a new Ommegang beer, whisky, and even Game of Thrones Oreos. Now, you can throw back wine like Cersei because there are official Thrones wines available before the final season debuts on April 14. 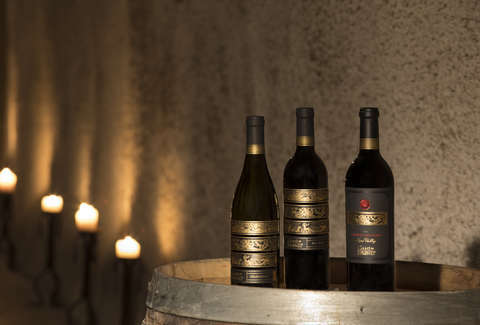 Award-winning winemaker and Wine Enthusiast's 2011 "Winemaker of the Year" Bob Cabral, who counts himself as a big fan of the show, created the three wines for the Lannister inside each of us. There's a red wine blend (Paso Robles, California), a Chardonnay (Central Coast, California), and a Pinot Noir (Willamette Valley, Oregon) that "match the strength of the characters and the terrain of their kingdoms," the Vintage Wine Estates website says. The bottles cost $20 through either the site or, in select states, alcohol delivery service Drizly. Each order comes with a GoT corkscrew as well. (If you want the corkscrew, you need to add it to your cart before checking out.) In addition to the themed labels, each cork is imprinted with the sigil of either House Martell or House Tyrell. However, like anything in Westeros, there's bad news mixed with the good news. Vintage Wine Estates has sold out of the red blend and the Pinot Noir. The Chardonnay remains available, though. The good news is, a representative tells Thrillist, the sold-out varieties will once again be available in April. So, there's still hope for you to have a glass of the Pinot Noir in your hand when the battle for Westeros resumes.